A surprising 64 percent of marketers are spending five or more hours weekly using social media sites like Twitter, found the just-released Social Media Marketing Industry Report: How Marketers Are Using Social Media to Grow Their Businesses. Businesses of all sizes are leaping into the social media pool--and many are well-known brands. Computer giant Dell recently reported a million dollars in sales by issuing coupons on Twitter. Even Ford is using social media to interact directly with its customers. However, for most marketing pros, social media marketing is a fresh new phenomenon--and it's not just for the young professional. Among the 880 marketers surveyed, 72 percent have been at it for only a few months, and the median age was 40 to 49. "This is a story nobody else is telling," explains Stelzner. "Most marketers know the future is social media, but they aren't sure how their competitors are playing the game." The big questions marketers most want answered about social media are also revealed in the comprehensive report. Knowing where to start and if there is real money to be made were among the top questions pros want answered. The report also takes a close look at the social media tools used by marketers. "It's intriguing to see which sites the pros focus on compared to the newbies," Stelzner comments. Twitter is the big winner among all marketers, with 86 percent regularly tweeting. Packed with 30 color charts and diagrams, the report is sure to be a quick digest for any newcomer or time-starved executive. 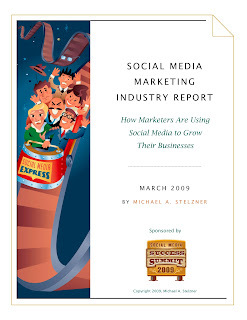 Special Alert: This report contains a promotion and information about a BIG event at the end of May called "Social Media Success Summit 2009," starring huge social media names such as Gary Vaynerchuk (Wine Library TV), Darren Rowse (co-author of Problogger), Ann Handley (MarketingProfs), Mari Smith (Queen of Facebook), Jason Alba (wrote the book on LinkedIn), Denise Wakeman (BlogSquad), Chris Garrett (author of Problogger) and Brian Clark (copyblogger). Author - I'm on LinkedIn -- Now What?? ?